What can you do with Data Monitoring? Easy point-and-click links to all of your reporting and analysis tools; click on any station to see the current values and active alarms. 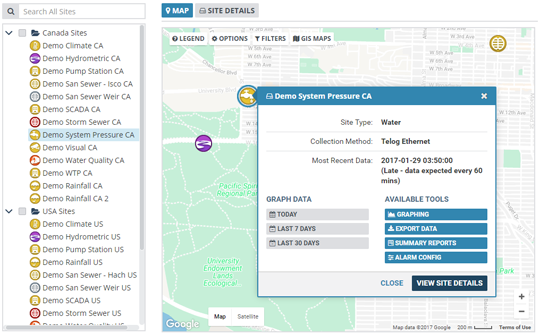 Overlay your GIS data to get a complete view of your infrastructure. 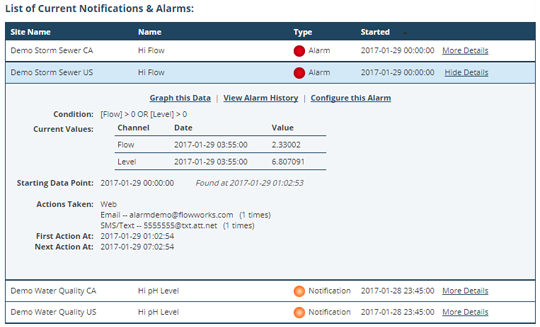 Define rules and conditions for FlowWorks to actively monitor your data as it arrives. Use Late Alarms to be notified when data hasn’t arrived on schedule. Receive instant email, SMS, and voice notifications as soon as an alarm occurs. Maintain fine-grained control of alarm settings, behavior, and recipients. Take advantage of the ability to view images from your site cameras. Capture river bed movement, trash rack buildup, or flood stage observations.